Fujifilm has introduced a new range of bridge cameras to sit in its premium compact camera range in the S-series. The S4500 and S4200 are billed as the "highlight" of the range, featuring 30x and 24x lenses respectively. Both feature a 14 million pixel sensor and 3 inch 230K dot LCD screen at the back of the camera. Both cameras include a 1/2.3-inch CD sensor, while the ISO ranges from 64 up to 6400 using Fujifilm's proprietary CCD-Shift image stabilisation to help keep images sharp. HD video recording at 720p at 30fps is available, while an HDMI output can be used to connect the cameras to an HD ready TV for instant playback. Full manual shooting made can be accessed via the mode dial, along with other shooting modes such as shutter priority and aperture priority mode. Start-up times have been optimised, while Auto Focus has also been quickened. An 200,000 dot electronic viewfinder (EVF) is available in conjunction with the LCD screen on the rear of the camera. Brightness of the screens has been improved to help details and colours appear more realistic. 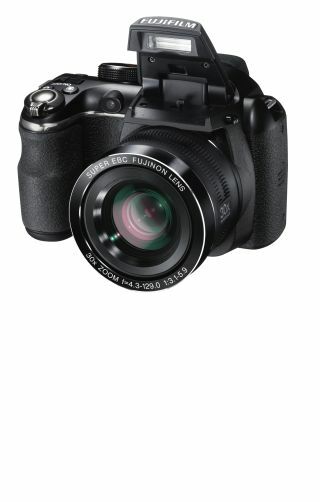 The Fujifilm Finepix S4500 and Finepix S4200 UK price is not yet known, stay tuned for further updates. Also announced are the SL300 and SL240, which also feature a 30x and 24x zoom lens, respectively, but feature rechargeable lithium batteries in place of the AA batteries used by the S4500 and S4200.